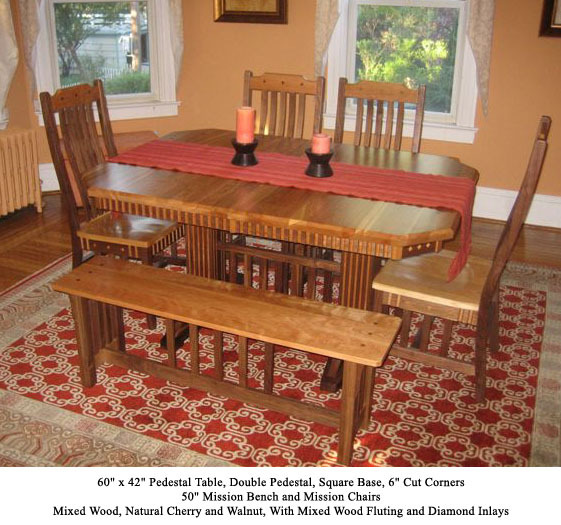 Having enjoyed our Mission dining room table and Western chairs over the years, we asked Harmony Cedar to craft some custom tables for the living room. Once again, Rick, Eli, Susan and all the Harmony Cedar folks exceeded our expectations. The tables are beautiful! Great people to deal with, wonderful craftsmanship, and rock solid quality. It doesn’t get any better, thanks! The chest arrived today, safe and sound. We are really please with the chest. The color and style match our bedroom furniture perfectly. We believe this will be an heirloom we can pass along to future generations of our family. We are very pleased with our new chest. Congratulations on such a beautiful piece of art. We received the table and it was beautiful. Your delivery guy was also great and took extra care in bringing it into the house here in N.C. It went together just fine and looks great in the new dining room . Harmony Cedar has been a pleasure to work with. I contacted them about a dresser that I wanted made along with two nightstands and gave them the measurements I had in mind, and to incorporate a carved lighthouse in the pieces which they did, working with their craftsmen. And I've been a repeat customers on three different occasions. Later I contacted them to make three more pieces which included a shelve so I could I have a place to put my nautical figurines and two more nightstands which really are multipurpose and very functional pieces. 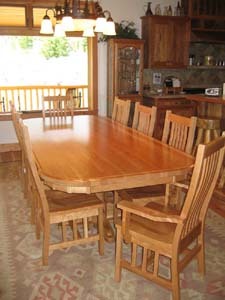 Harmony Cedar's pieces are built to last and are heirloom pieces. The quality is best and the company will do what ever they can to make sure you're completely satisfied. I was looking for a chest that was made in the USA. All of the local furniture stores only carried made in China products. I was very please when I received the chest and it arrived before Christmas, because I ordered it on Dec 7th. The service I received from Susan was excellent and the chest is beautiful. My wife was very pleased with her Christmas present. Thank you! Mr. Miller just finished delivering our new cedar chest. It is really beautiful. ... Please pass on to who ever built the chest how much Jack & I like it. The hope chest is simply beautiful, and you should be very proud to have helped create such an incredible work of art. Both HW and Barbara were very impressed with the hope chest itself. Barbara actually opened up the hope chest to smell the Cedar and then called George over "Georgie, you have to smell the cedar". It was pretty cute! Thank you so much for making this happen! We are extremely satisfied with the quality and service we have received from you. Thank you for the beautiful table! We love it! "The chairs look even better in person then on the computer. Dan was great!" "Absolutely beautiful! It's exactly what I wanted and more. Thank you so much." "Everything was beautiful and delivered in great condition! 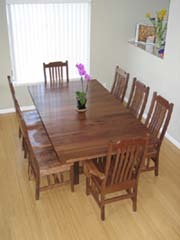 I am very satisfied with my order and would order from Harmony Cedar again, as well as recommend your company to friends." "Absolutely beautiful buffet. Exceptional customer service. The best furniture company that I have ever dealt with." "(My Wife and I) can't wait to order more furniture. This is the second time we have ordered from Harmony Cedar. We have told everyone we know about our great experience with your company!" "Hi, My name is Ross Crawford from Saskatoon. 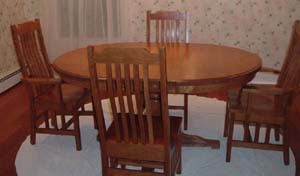 You made a complete dining room table, chairs and hutch for us, as well as a large table and chairs for our kitchen. 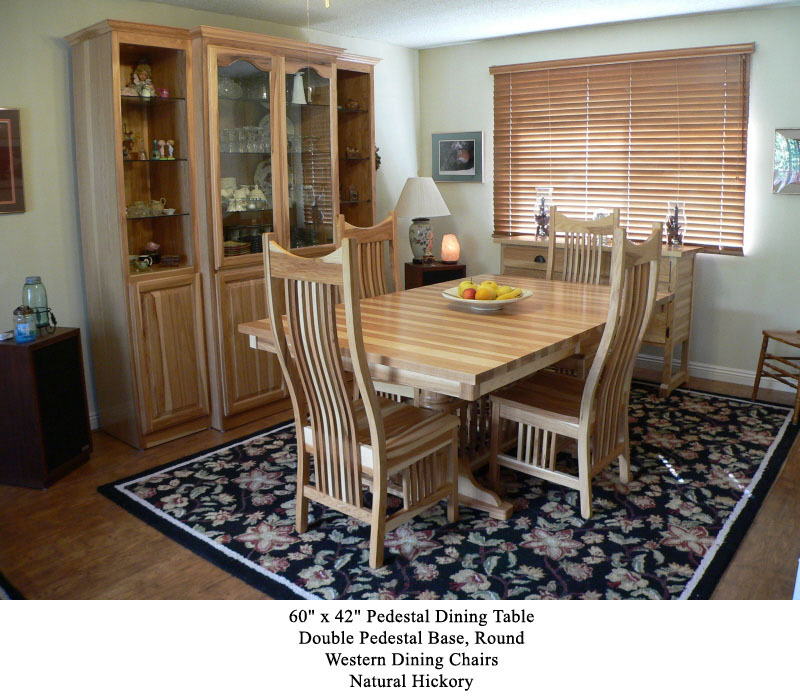 I was pleased to see that you still show our table and chairs and hutch in your OUR CUSTOMERS section. That is the way I found your web site. A personal friend had asked me to find it, because he wants some similar furniture. I have sent him your web site and again we have had some of your furniture for 9 yrs. and have NOT had one thing gone wrong or loose. Merry Christmas and a Happy New Year from a long time Customer, Ross Crawford, Saskatoon.SK. 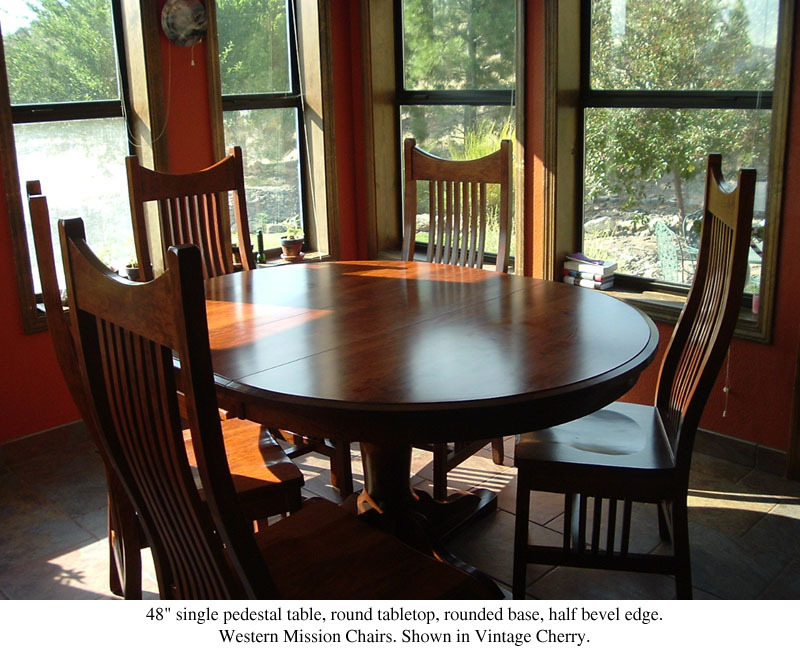 PS - I have seen Amish Furniture in stores here in Canada and NONE of it even comes close to what you sell, also I know your are very very reputable for selling to Canadians." "It is truly beautiful ... The quality of the workmanship and the wood is exceptional. We were interested in getting something American made with wood harvested in a sensible fashion. This goes way beyond that. The selection of neighboring grain patterns in the table top shows a level of craftmanship, patience, and respect for the wood that is unique. The black walnut itself is incredible as far as the way the grain looks from different angles. We're planning to enjoy this table for a long time. Thanks so much!" "The table is beautiful - as are the chairs." "It looks great!! Solid and beautifully made. So glad to have exactly the size and shape and color we were looking for." "We are really enjoying our new cherry table in the Wizard's Den. Solid as a rock and destined to become an heirloom." "Hi, Suzanne. I think you will already have two new customers -- the first two people who saw it. Yesterday a neighbor came over to see it. He left with your web address in hand. "You won't see anything like this anywhere else," he said. I couldn't be happier with the result." "The chest was delivered by a very kind helpful delivery man. He even re-wrapped it for us as it needs to be hidden for a future birthday. The chest arrived in perfect condition - not a nick or scratch. I couldn't be happier with the whole experience from purchase to delivery to the beautiful chest. " "I want to thank you for extra rush you put on my order to get it here for my wife's birthday. The chest is a work of art. the extra care you take in making sure it won't get damaged in shipping shows the care that is put into your products. Your honesty is refreshing and the quality is unsurpassed. Thank you and God Bless." "I am so pleased with the beautiful furniture! I also really appreciate the helpfulness of (Rick)." "Beautiful quality and finish. Delivery was great. Dan was very good a keeping in touch and the table was well protected in shipment. I wouldn't hesitate to recommend Harmony Cedar to anyone." 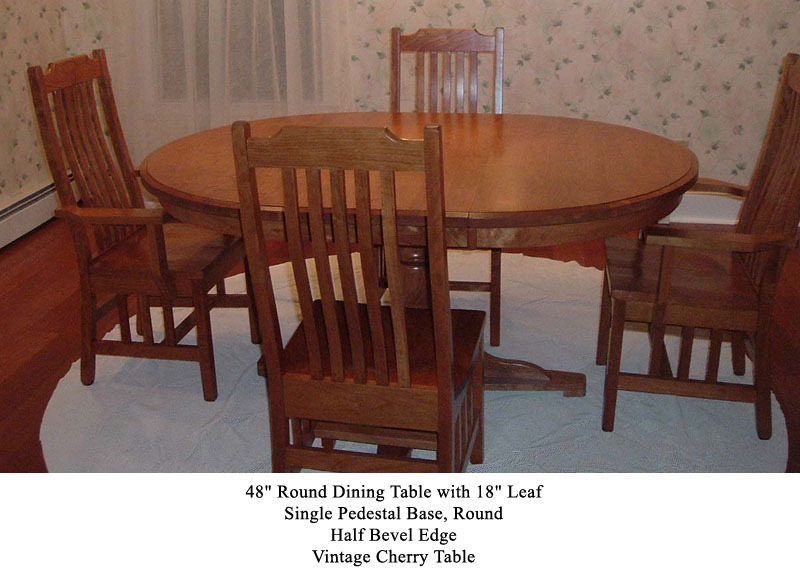 "Very beautiful table and chairs." 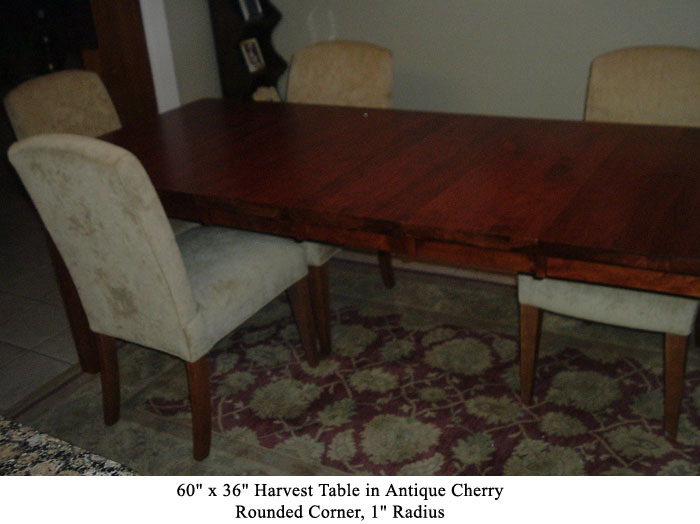 "We received our cherry dining room table and just love it! It looks like it was made to fit our dining room. The delivery and set-up went smoothly and every effort was made to protect the chairs and table during this process. 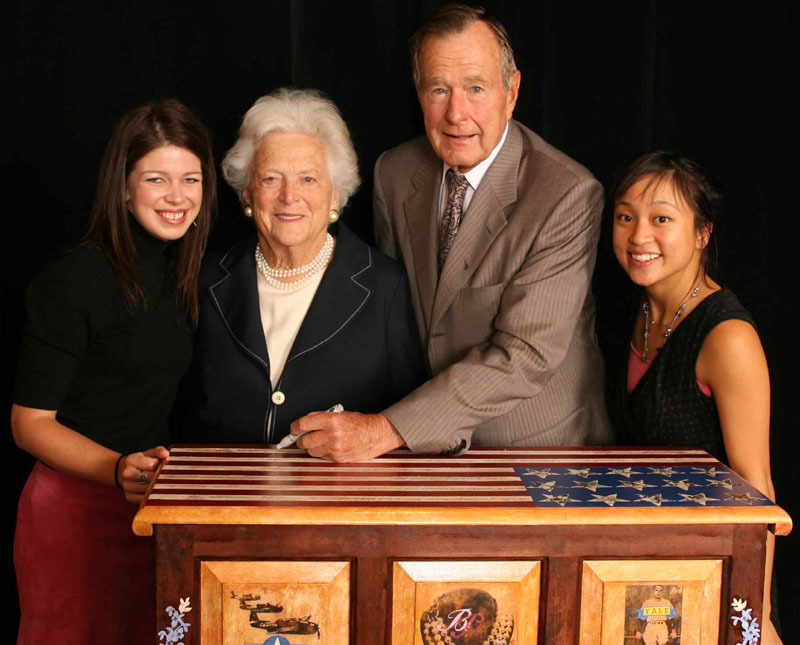 Thank you for making us such a beautiful piece of furniture that we will use and cherish for the rest of our lives." "Perfect! Exactly what we ordered, under 3 weeks, amazing! We are thrilled. (Thanks)." "The furniture is beautiful! It looks so nice in our home. I'm really glad we ordered this from you. Dan was wonderful while delivering and installing the new furniture. He even helped us remove the old stuff. Thank you!" 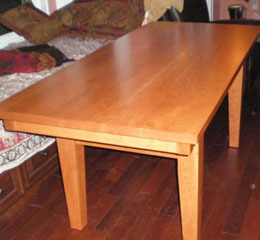 "Recieved the table & one bench - in good order. The table is beautiful - Thank you!" "I have to admit, I was a bit nervous when my husband approached me and admitted to finding you company on the web. He showed me your site and the products available..........I was still worried. There are so many unreliable companies out there with absolutely zero integrity. He ordered the dining table and chairs, out went our payment, and I crossed my fingers. 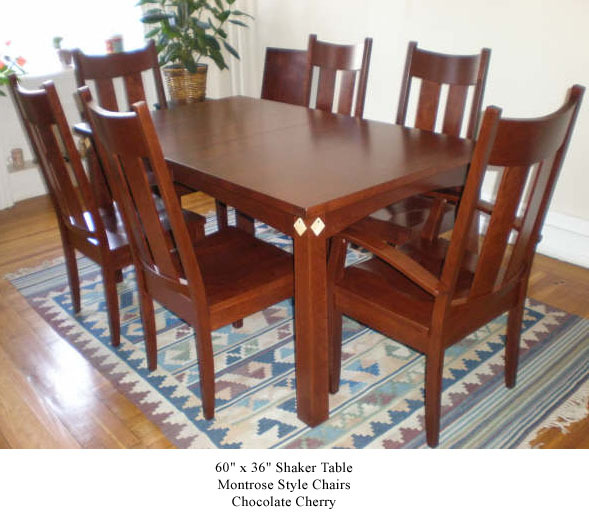 The day that the table and chairs arrived I was completely overwhelmed. They were absolutely beautiful!! The quality of workmanship and materials were far more than I expected. The table is very simple yet very elegant. The decor we chose is that of a Pottery Barn motif. All our family and friends are very impressed. This table will be in our family for a long long time. We are very thankful for the cooperation from your staff and enjoyed working with them. Keep up the good work!!" "Thanks! The table arrived and was well used over the the last two weeks ... We are very pleased with the craftsmanship and with our experience with you." "It's everything I asked for. Was delivered at 9:30, 30 minutes early. Thanks." 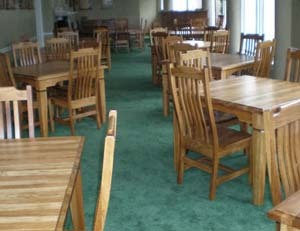 "We have been absolutely delighted with our tables and chairs. It’s impossible to walk by without reaching and touching them, the wood is so beautiful and the craftsmanship so fine. Our expectations have definitely been met and exceeded." "I feel I must comment on the exceptional delivery service as well. The hand delivery added so much more of a personal touch to what in most cases is just a routine operation. That the craftsman who created our table would take the time to come out and assemble it for us in situ is simply amazing." "Thanks so much for your wonderful service, artistry, quality and customer service. Peace to all there." "We were very happy with our service. We wanted to seat a large group and found Harmony Cedar that would build just what we wanted. We were able to seat 30 people at our tables for Thanksgiving Everything was just as promised and delivered on time. 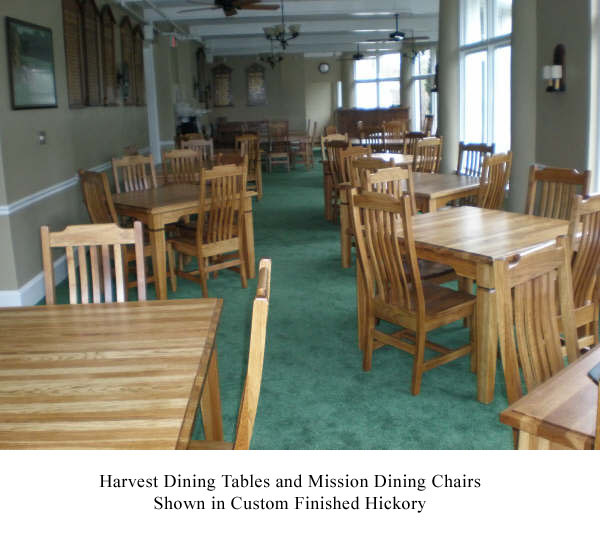 We were very happy with our tables and chairs." 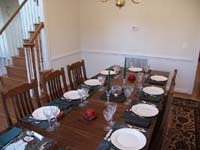 "The craftsmanship is wonderful, Harmony was easy to work with on my custom styling, and made sure I had my table in time to show it off to my family at Thanksgiving. (I was) so impressed with the delivery process and the care that went into that part of it. 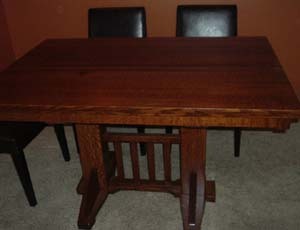 Ordering an expensive and custom table on the internet might seem scary, but I would recommend Harmony Cedar to anyone!" "Rick, The furniture arrived and is all set up. It looks fantastic ... I need 8 more identical chairs. That will give us all we need when the room is absolutely full." "I had the room built to accommodate the table ... I just love the table and chairs!" "The table and chairs look fantastic. Driver delivered at convenient time and did a great job!" "I wanted to make sure that you knew how happy I am with my natural cherry shaker chest. It came crated up so carefully, and promptly. It is only a few months in my house and already deepening in color. I love it and highly recommend any of your products. Thank you for a reasonably priced, beautifully hand-crafted, well-made piece of furniture." "The chest I ordered came in a very timely manner given the product. It was very well packaged and protected from damage. 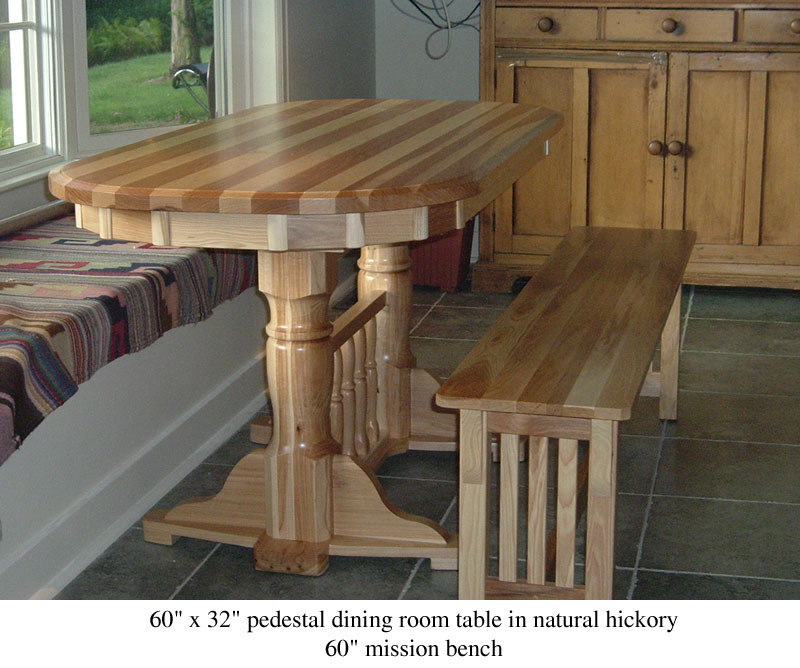 I am very impressed by Harmony Cedar's products and services." "In July 2006, we purchased a Cedar Chest for our 25th Wedding Anniversary. We had been shopping locally (Southern California) for quite some time and found the selection limited and the quality was not what we would settle for. Then we discovered your website and the search was over. We were very impressed with the variety in style, sizes and options. "It is beautiful. Excellent workmanship. Especially happy with packing for shipment. Extremely well protected against damage." "The chest is absolutely perfect! It's exactly what I wanted. Pristine, beautiful. Simple Elegance! My expectations were exceeded - I love my cedar chest!! In a world where most things are sub-standard (& unfortunately accepted as such) Fine craftsmanship still exists." 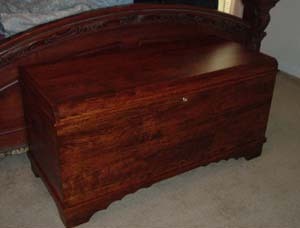 "I received my cedar chest Monday. I was very pleased and love the natural cedar fragrance. The workmanship is truly excellent and just what I envisioned. Thanks so much." We thoroughly enjoy the furniture. The table, chairs, and server are as attractive as we anticipated. It is obvious all the pieces were made with great skill and attention to detail. (The craftsman) showed great care in unpacking and setting up the furniture. The time (he) took to demonstrate how drawers can be removed from the server, and leaves installed in the table was appreciated. The furniture was put to an immediate test with a family get-together during the weekend. Everyone was impressed with the furniture, its sturdiness, and handsomeness. We have, and will, passed on information about your company to friends and relatives. 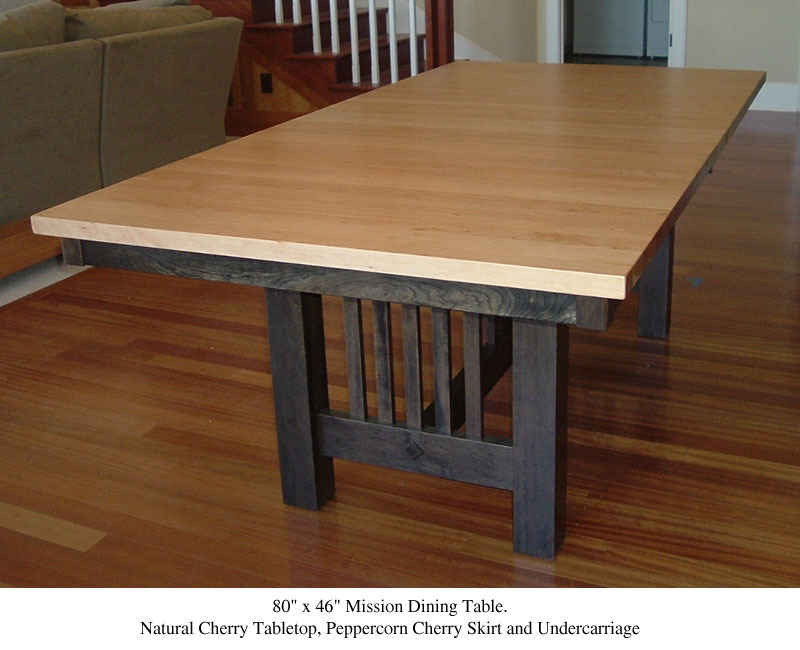 "The workmanship and quality of the wood is unlike anything I've ever seen, and I have been looking for the perfect dining table for over 10 years! I'm delighted to report my search is over. Thank you for your most excellent service, and your patience." "Please let (everyone) know how much we appreciate everything you do to provide a work of art that defines form and function, and will last for generations." "My husband and I are thoroughly pleased with our new blanket chest. It was shipped to us with the utmost care, and as soon as we saw it we knew we had spent our money wisely. It is gorgeous, incredibly well-made, true to the color shown on your website (so it matches our existing furniture) and even smells terrific! Thank you all so much!" The furniture was put to an immediate test with a family get-together during the weekend. Everyone was impressed with the furniture, its sturdiness, and handsomeness. We have, and will, passed on information about your company to friends and relatives. We cannot promise anything, but hope some of these referrals will result in further business for Harmony. We discovered Harmony through a stumbling Internet search. Our reasons for selecting Harmony centered on the style of furniture you offer, and the chance to do business with a local company. We could not be happier with the results. "Delighted, gorgeous. Everyone on Long Island will know about Harmony Cedar now. (We) will call you when we're ready to order again." 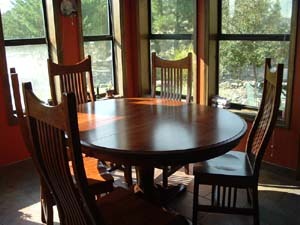 "Great service, beautiful table & chairs. 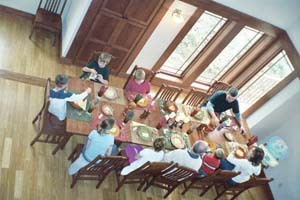 Family uses the furniture in their cabin. 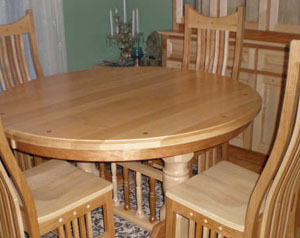 The table and chairs were crafted and delivered in less time then expected. We are very thrilled with (Harmony Cedar)". "My order arrived today, one hour earlier than expected. What a welcomed experience start to finish. I have never ordered furniture without first seeing the piece first hand but after doing months of local furniture stores look & see, I was not happy with the quality of workmanship or quality of the products. Lots of local available stuff was made of pressed particle board and/or made from outside the United States. Most were take what is here or forget it. 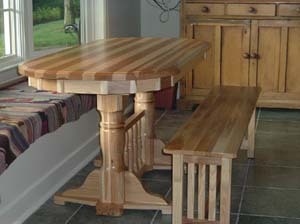 I have heard of the legendary Amish craftsmanship over the years so when I looked at your website I was very impressed. Every aspect can be changed to meet your needs. I called Gail that night. You could not have a better person to ease your doubts about ordering sight unseen. I picked out what I wanted down to the type of wood, size, shape and finish. 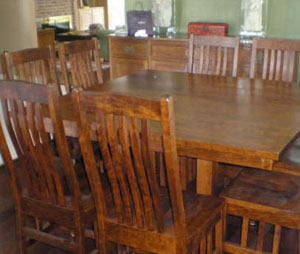 I ordered a dining table and eight matching chairs. Eli who made our table and supervised the making of the chairs also helped deliver and set up our order. It was very nice to shake the hand of the craftsman who made your furniture. A joy to talk to. This is what it must have been like 100 years ago when you went to the home of a furniture make to get your local hand made furniture. This set was far better, in every aspect, than any of the ones in the Seattle are. Solid oak. 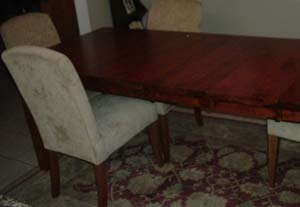 Our last table was 38 years young, this one will be serving food to my great great grand children in style. 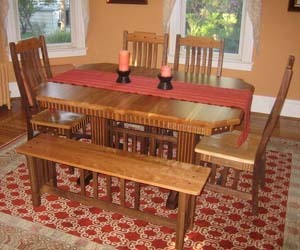 I highly recommend Harmony Cedar furniture. Great furniture, great prices, with outstanding people. What every company should strive for! "Chest arrived today and in superb condition (very nice packing job I might add). 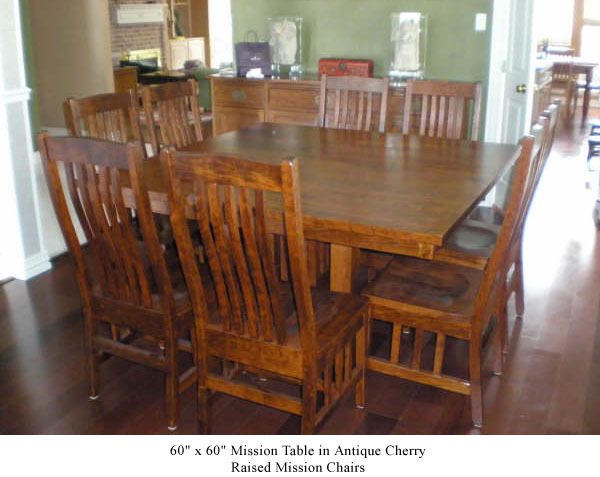 We are very happy w/ our purchase and already have a co-worker interested in a similar product (he has our wood samples for consideration if he desires to go the cherry route). 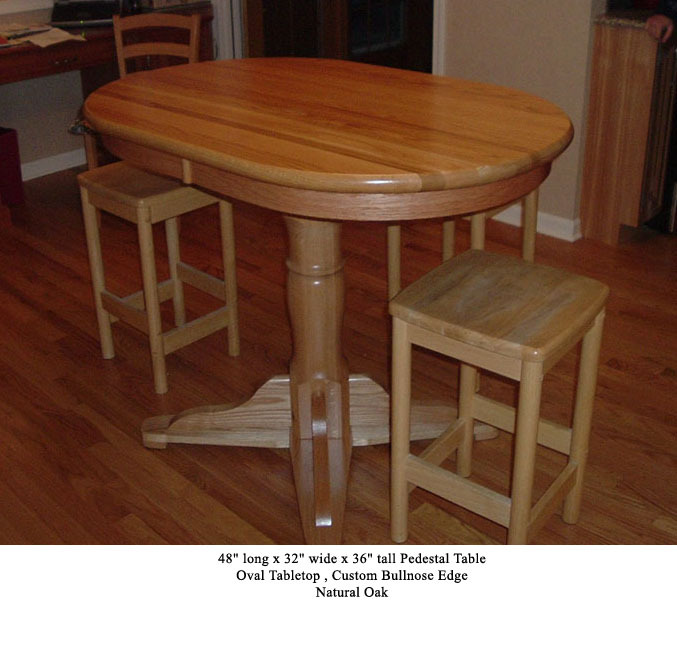 "We absolutely love the table, and the customer service and delivery were top-notch!" "The cedar chest I ordered is absolutely exquisite. I love all the 'options' available to create exactly what I want. My 1st order ended up not being large enough - the replacement process was effortless. I will be revisiting you for future furniture needs." "Thank you so much. The table and chairs are incredible. We were able to have mother's day with my 91 1/2yr mother and she thought the table and chairs were beautiful. I just missed the delivery with (the craftsman) and had even made cookies for his return trip." "Is it what (we) expected? Yes, yes, yes! After ordering a cedar chest for our oldest daughter's graduation 3 years ago, we had no doubt in our minds where we wanted to get one for our 2nd daughter's graduation. The quality is unsurpassable, the workmanship & attention to detail were well worth the price. Thanks again for making a fine piece of furniture. Please share our comments! No one compares to the quality!" "Is it what (we) expected? Yes, yes, yes! After ordering a cedar chest for our oldest daughter's graduation 3 years ago, we had no doubt in our minds where we wanted to get one for our 2nd daughter's graduation. The quality is unsurpassable, the workmanship & attention to detail were well worth the price. Thanks again for making a fine piece of furniture. Please share our comments! No one compares to the Harmony Cedar quality!" "Dear Harmony Cedar, In July 2006, we purchased a Jumbo 54” Wild Cherry Harmony Cedar Chest for our 25th Wedding Anniversary. We had been shopping locally (Southern California) for quite some time and found the selection limited and the quality was not what we would settle for. Then we discovered your website and the search was over. We were very impressed with the variety in style, sizes and options. However, we were very hesitant to make a large purchase such as this over the internet sight unseen. A big concern was the safe delivery of the chest. We had a frustrating experience with an outdoor bench of similar size and weight as the chest. Due to poor packing we went through several months and several damaged shipments before giving up on that vendor. In reading some of the testimonials on your website, we were heartened by the positive comments made regarding the quality and care of your packaging. Before ordering we had a few questions ... We placed our order a few days later. We were pleasantly surprised when the chest arrived well before the estimated delivery date. The testimonials about the packaging quality were right on the money. Truly incredible! We had cautious high expectations about this purchase but when the chest was uncrated it was so beautiful that it took our breath away. The quality, style and finish are all first rate. It was a pleasant experience dealing with Harmony Cedar from beginning to end. The chest now sits in our master bedroom where we can admire its beauty and craftsmanship daily. It has been a wonderful anniversary gift to ourselves. Thank you so much. 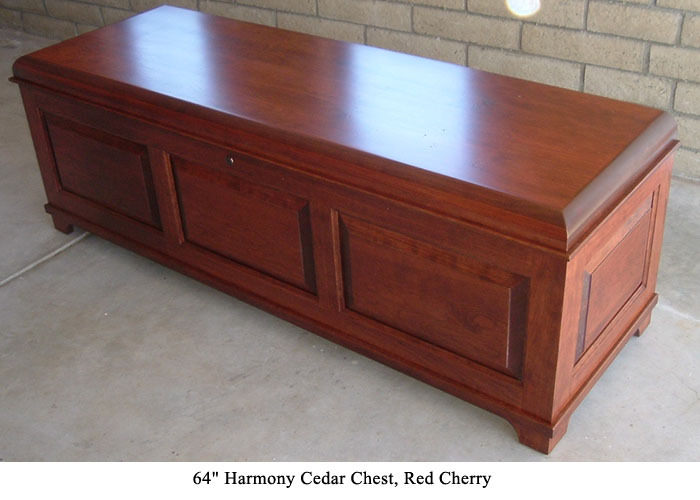 Roger & Cathy Harman Downey, CA"
I would recommend Harmony Cedar to anyone wanting a beautiful hope chest with wonderful personal service and kind people to deal with. We could not be happier with our purchase and we may be purchasing a 3rd one in a few years for the next daughter. Thank you so much!" ""I bought my first "real wood" table (The Lancaster model) from Harmony Cedar, and I couldn't be more pleased with the results. 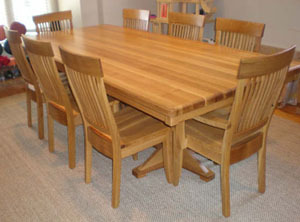 Quarter-sawn light oak in my beautiful dining room table really makes an impression. I recommend them highly." "Good morning, Harmony Cedar staff, We wanted to let you know that our (extra large Harmony dark cherry finish) chest arrived in a very timely manner after we placed our order, in pristine condition as the result of excellent packing. You communicated the status of our order promptly and completely throughout the process. And, most importantly, the craftmanship and material are just beautiful! We like our chest so much we'll probably order a larger companion one for the same room very soon. 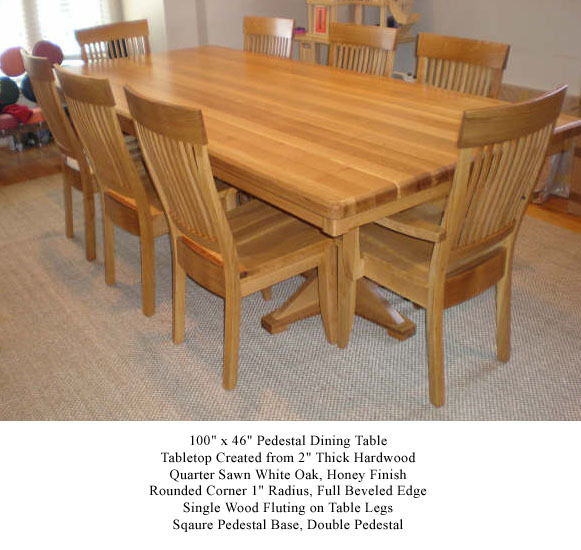 We'll certainly pass your web site information along to friends and family looking for fine wood products. Thanks for being all you claim to be, and more! Best wishes for continued success. Sincerely, Marilyn Clark Columbus, Ohio "
"I am writing to convey my appreciation to all at Harmony Cedar who were in any way involved with my order. From the onset, it was a pleasure to deal with your company. There was never any doubt that my order would arrive in perfect condition, & on time for the occasion. As the purchaser, your exemplar craftmanship and service instilled tremendous confidence for me. My future daughter-in-law - the bride-to-be - was the recipient of the Hope Chest. Not only was she overwhelmed by it's beauty, but the 50+ ladies who attended her bridal shower were equally impressed by it. 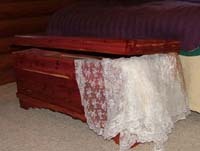 I was only too pleased to pass on the name Harmony Cedar to those who inquired about the manufacturer of the Hope Chest. "The Ohhs and ahhs I received on the Harmony Cedar Baskets made all my purchases very worthwhile. My sister received the big Lotus basket from me and carried it around with her the rest of the day so she could show people." "Hi Rick. To say we are happy with the table and chairs would be a huge understatement, we absolutely love it and it looks so at home in our dining room. 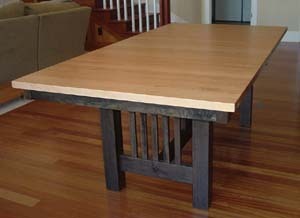 Every special occassion when we use the table is made so much more enjoyable by the look and feel of the wood. It looked exactly how I imagined it would and fitted perfectly into the room we set it up in. Our search in the UK had been a failure and I was beginning to believe that we would not find anywhere the type of furniture we had in mind, until we came across your website on the internet. All our friends and visitors comment on the table and I enjoy telling them of our search and how we imported it from the U.S. Thanks so much Rick to you and your good lady. Best regards. Tony & Stephanie Pace. " "Dear sirs: My cedar chest arrived today, and I am writing to tell you how pleased I am with it. It is exactly as represented if not better. I certainly would recommend your company to others and will contact you before buying any other furniture from another company. DEStark"
"My husband, kids & I all LOVE our custom sized 64" cedar chest. We use it as a toy chest - delighted that chest came with safety hinges. No worries about top slamming down. We are already planning our next custom purchase!" "My 54" square table is gorgeous and I love it! I'd never spent this much money on a table before. So even after it arrived I still looked around at other furniture stores, found nothing that even came close to the quality of my table. Delivery was very accommodating to my schedule. " "My classic red cedar chest is more than I expected. It is simply gorgeous and more beautiful than the picture on the website. The workmanship is outstanding and the packing was top rate. Thank you so much for my wonderful Christmas present!" 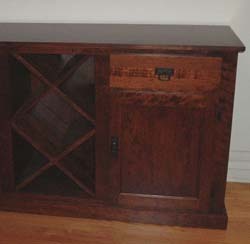 "In November 2005, I ordered a Cherry Wood Hope Chest from your web site as a Christmas present. I requested that it be delivered on or about December 15, 2005. Delivery was made on December 16, 2005. The Hope Chest is an absolutely beautiful piece of furniture. My wife and I simply love it. It is a perfect example of expert workmanship that is unfortunately rare today. Combining this expert workmanship with your prompt, friendly and reliable customer service has earned you two very happy customers sure to return in the future. Thank you very much. Sincerely, Kevin S. Carroll, Utica, New York"
"I wanted to let you know that I received my new Chest yesterday, when I arrived home from work. Thank you very much for all your help. I am quite pleased with my purchase and know that I will enjoy it for many years to come." "I just wanted to Thank you again for my wifes hope chest. In case you didn't get my phone message we both are so pleased with your whole buying experience. I have never seen a package wrapped like you folks did and it was perfect. 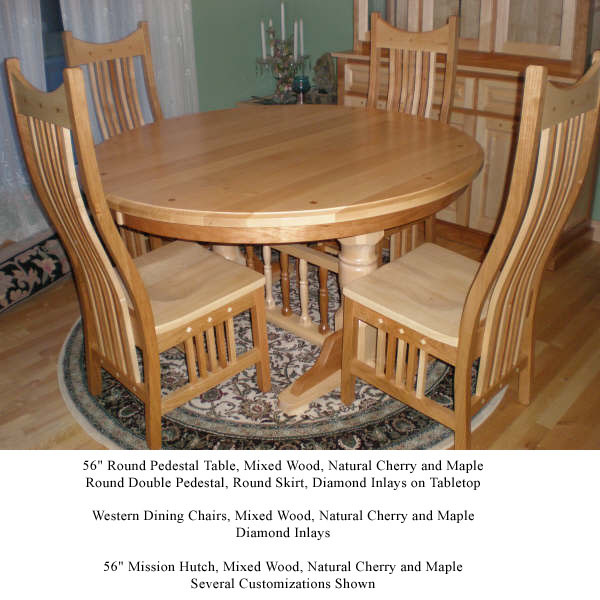 Jerry & Sheryl Rosenberg"
"I bought a jumbo mission maple for my fiancee as her wedding present. You guys made sure it arrived so that it did not spoil the surprise. When it showed up, though, we were both surprised by its beauty! The pictures on the website don't do the beauty and craftsmanship justice!" "The chest arrived today. It is wonderful. Great product. It's my daughter's hope chest. She's getting married in June. I'll be sure to recommend you to anyone who asks. Thanks! Paula"
"Everything was great! The order arrived on time, it was in my mailbox on Saturday. The basket made a perfect centerpiece for the dining room table on Easter -- my wife had it filled with candy eggs, jelly beans, etc." "The music box was a gift -- I really like it. The quality of the tone is excellent - the simplicity of the cherry wood box is perfect for the music mechanism." 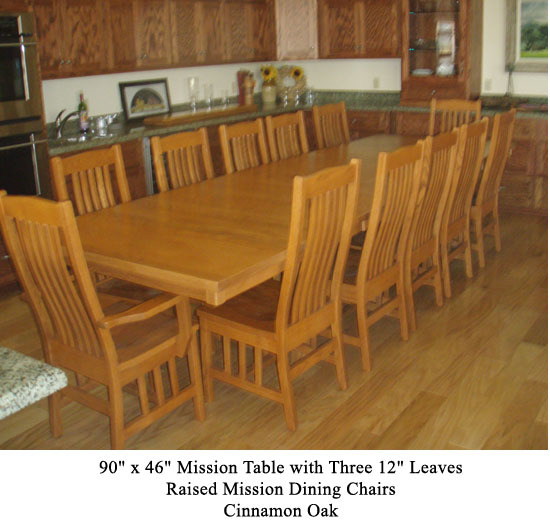 "I would like to THANK YOU for working with me on my lay-away of a Black Walnut Mission Dining table and 6 chairs. (The craftsman) delivered it today and it is just simply beautiful. 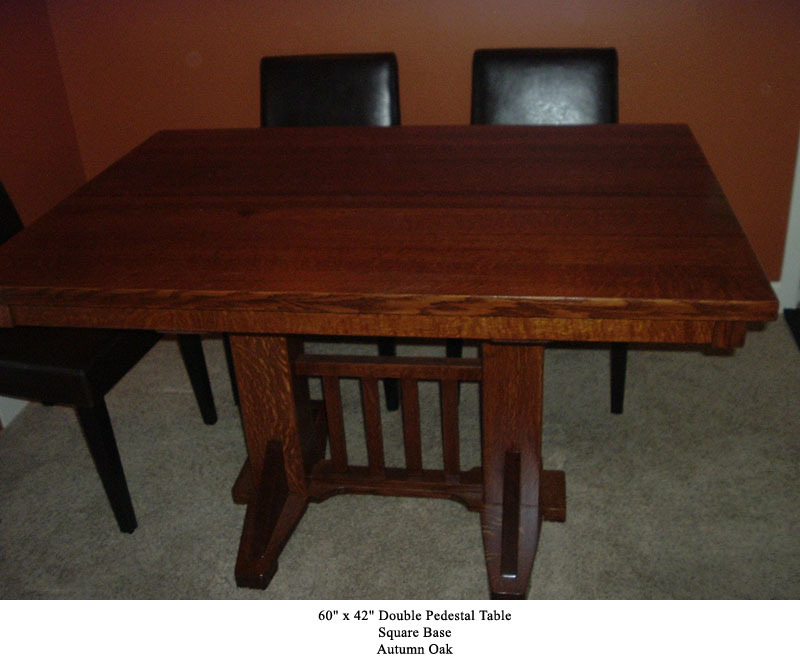 He did an incredible job on making this table and I am so very happy with it." "I can honestly say that it has been a pleasure working with your company ... to get an original, quality, handmade product that will be in our family for generations to come. I can't tell how proud we were of our dining table when we had 14 family members all around the table comfortably and enjoying a meal together. I would not hesitate to recommend your company to anyone looking for fine furniture. " "The table and two chairs arrived this afternoon. THEY ARE ABSOLULTELY BEAUTIFUL.....much more beautiful and quality built than we ever expected. We are completely thrilled about the craftsmanship and design. THANK YOU! Please let the craftsmen know how impressed and happy we are with their work. This is something we'll treasure and pass down for generations to come! ... The entire set is just gorgeous. We've been showing it off to all of our friends. Thank you!" 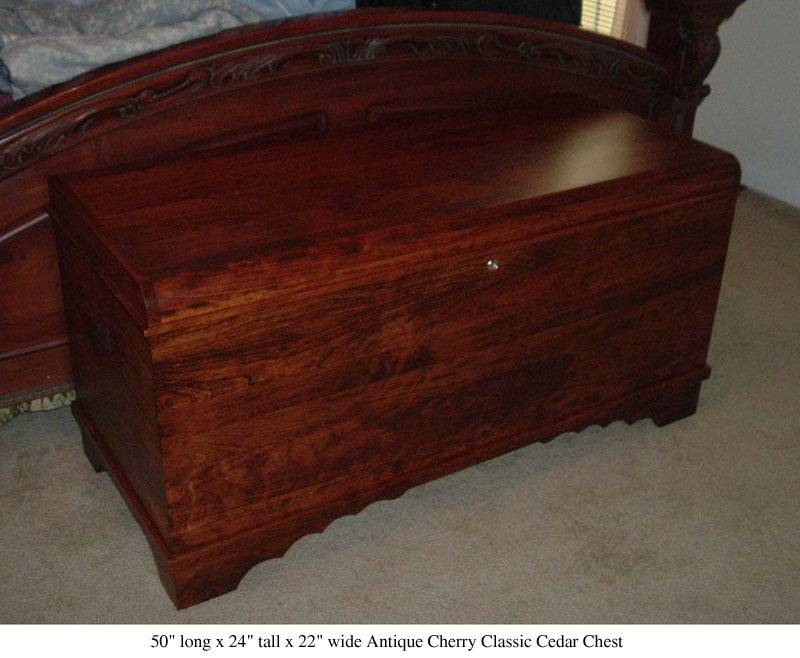 "
"I ordered a large classic chest on 11/17/02 and received it on 12/3/02. I absolutely love it. It is all I expected and then some! Very prompt delivery -- the perfect Christmas present for my wife." "Thank You! Thank You! Thank You! My Cedar Chest arrived today - Fri 10/24. I love it! It arrived in perfect condition. :) I received this as a gift from my husband for my birthday! I'll enjoy it for many years to come & plan on passing it on to our daughter some day! The workmanship is exquisite!" "I was very surprised and pleased to receive my order today. I was astounded that it was delivered on Monday after I ordered it early Saturday morning. That is great service and I really think your products are wonderful. Keep up your wonderful work." "We wanted to let you know that our chest arrived in a very timely manner after we placed our order, in pristine condition as the result of excellent packing. You communicated the status of our order promptly and completely throughout the process. And, most importantly, the craftmanship and material are just beautiful! We like our chest so much we'll probably order a larger companion one for the same room very soon. 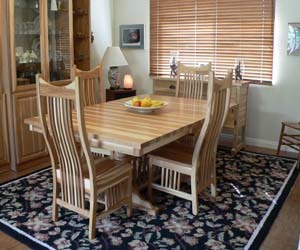 We'll certainly pass your web site information along to friends and family looking for fine wood products. Thanks for being all you claim to be, and more! Best wishes for continued success. Sincerely, Marilyn Clark Columbus, Ohio "
"The chest arrived this afternoon in perfect condition. It is absolutely beautiful. We are very pleased!! Thanks, again. Ron Johnson"
"My chest arrived and even though I only unpacked it a little bit, it looks absolutely wonderful. Thanks for getting it here on time for my daughter's birthday. I am so pleased...I wish I had one for myself. I will definitely recommend you to others. Janice Padden"
"I wanted to thank you for the wonderful chest I received. It was exactly what I wanted. The workmanship is exquisite and it is a pleasure to just look at it. Your service is also exceptional. Thanks again for everything!!!!" "I apologize for not writing this sooner. I received my new table about a month or so ago, an d just wanted to thank you and your company. The service was wonderful, the table is beautiful, and the craftmanship is wonderful, and delivery and set up went very well. I have had friends and family ask where we got out table and have referred them to you. Thank you very much, and hope to do business with your company again." "Hi, I wanted to let you know that the honey oak chest we ordered from your company arrived last week. It is absolutely beautiful! We are so pleased with it in every way. (And the careful way in which it was packed meant that it arrived in perfect condition.) It is a wonderful additional to our home and I know that it will be a treasure for many years to come. Thanks again. Sincerely, Patricia Curran"
"I like the flip-up handles that locks the baskets in place and the careful sawing to create the "spiral" that allows it to form a basket. Good clean Amish work." 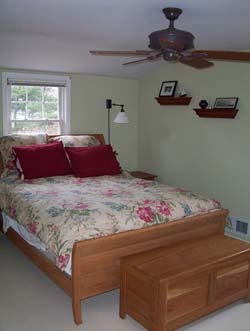 "We received the walnut headboard last week and installed it. It looks very good--excellent workmanship. Our thanks to the craftsman that built it and to the driver that delivered it. 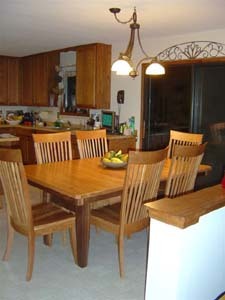 Bob Westfall Cocoa, FL"
"We couldn't be more pleased with our table and chairs. The workmanship is outstanding - it is a beautiful piece of furniture and a beautiful piece of art. In addition, your service is far beyond any we have experienced. The inserts for our table didn't fit in their storage space as intended. Since it still fit under the table when it was closed, we were fine with it as is - but the gentleman that delivered the table insisted on 'fixing' it and so a young man traveled by bus to spend 20 minutes at our home to fix it so it fit in its storeage space as intended. We felt bad that the young man came so far and had to leave so quickly, but he wanted to get back to the bus station to leave on the next available bus. We are truly impressed and have told others that are seeking furniture. In fact, when finances permit, we have our eye on some of the other furniture pieces. Please feel welcome to share our comments with others. 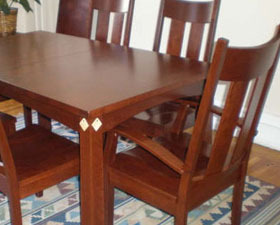 We are extremely impressed and pleased with the furniture and your service. Happy Holidays Jane Nelson"
"I received my chest on Monday. Thank you very much. It is exactly what I wanted. I am sure I will be ordering from you again as soon as I have more room!!. I will also recommend you to my friends. You delivered exactly what you promised. " "Very nice & good quality chest. Very pretty & well made. Will be doing more business with you guys in the future. " "The chest is beautiful & arrived 1 day before Christmas as promised even though the first chest delivered was the wrong color & had to be replaced. Great customer service." "To say we are happy with the table and chairs would be a huge understatement, we absolutely love it and it looks so at home in our dining room. 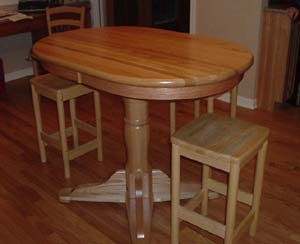 Every special occassion when we use the table is made so much more enjoyable by the look and feel of the wood. It looked exactly how I imagined it would and fitted perfectly into the room we set it up in. Our search in the UK had been a failure and I was beginning to believe that we would not find anywhere the type of furniture we had in mind, until we came across your website on the internet. All our friends and visitors comment on the table and I enjoy telling them of our search and how we imported it from the U.S. Thanks so much to you and your good lady. Best regards. Tony & Stephanie Pace. " "We received our chest today. It is absolutely beautiful. We are so pleased with the workmanship, wood and style. Thank you very much. It came without incident, delivered by UPS, with no scratches, bumps or problems. We look forward to ordering again from you. Sincerely, Janna Glasser and John Reed"
"My cedar chest arrived today (#1873-0887-8499) and I couldn't be more pleased. It is even nicer than I could have imagined. Thank you for your good work. Madeleine Raymond"
"I received my Apple Basket today! It's absolutely gorgeous! What quality craftmanship. Your company is a pleasure to work with! Shipping was very quick and I can't say enough about the quality! My Mother-in-law is sure gonna love this Christmas gift!!! Thanks so much!" "I am writing to you to let you know that my chest arrived today and it is absolutely BEAUTIFUL. The workmanship is wonderful. Just wanted to say thank you for a wonderful piece of furniture. All who were involved in the making of this piece should be very proud. Thank You. Nancy Pellecchia"
"The chest arrived this afternoon in perfect condition. It's beautiful and my wife and I are extremely pleased with it. It is good that you packed it as well as you did, because the packaging was pretty beat up. Thank you very much for your time and care. Bruce Anderson"
"We received our cedar chest on Friday. It's absolutely beautiful and matches our bedroom suite perfectly. Thanks very much! Peggy Alexander"
"Thanks so much for the samples. The chest arrived today and its so beautiful. We are so pleased! Thank you." "Just wanted to let you know that the Mission Cedar Chest arrived yesterday. It is beautiful--more than I expected! And it arrived without a scratch. Thanks so much." "Thank you, the chest arrived safely, and is truly wonderful! My daughter loves it, and it is just want she wanted for her birthday. The quality of the workmanship is excellent, which is always a bit of a concern when ordering something only seen online. She looks forward to having the chest for many, many years. David Feldman"
"Ladies and Gentlemen: You might be interested to know that the Cedar chest I ordered from you arrived without blemish. You might further be interested to know that I am exceedingly pleased with its superb finish on the outside, and also its slow-closing lid. What a marvelous piece of overall craftsmanship. I am especially pleased with the smoothness of the unfinished interior. The aroma needs no description for you, because you are used to it, but for someone who hasn't experienced it since childhood, it fits well in its new environment. You should be proud of this product, which I am sure you must be. Cordially, RD Volkman"
"We wanted to give a gift that felt thoughtful and lasting to my parents for all their support in our wedding. We were entirely satisfied with the quality and the message of this chest." "I received my Chest yesterday and I just wanted to let you know that it arrived in perfect condition and it is so beautiful. I had been looking for a cedar chest for some time. I needed one that was smaller than 38 and didnt really care for any made by Lane and they are all so large so I got on the Internet just to see if there were any other brands I could look at and I came across your web site. I really had hopping on the Internet, but you have the best web site. I looked at your site and that chest for 3 or 4 days, its such an easy site and you have great pictures and a very good explanation, but I admit I was very hesitant. I wasnt sure if the dark oak was really dark, I worried it wouldnt look like the picture and then I worried it wouldn't arrive by UPS in good condition, but I took a chance and called you and ordered it. After a week or so I started watching for it to arrive, I would hang around so I could be here when UPS came so I called you to find out when it had been shipped, you called me back and then your partner called me that evening, not knowing you had called me, what great customer service. Then it arrived a couple of days later, wow its so beautiful the color is a warm medium Oak just perfect and the finish on it is beautiful, solid Oak, no pressed wood and the domed lid is so unique, different than a flat lid. Im so glad I took a chance on your company, thank you for a truly beautiful product with excellent workmanship." "We received the chest today. It was well-packed and looks fantastic. It is a gift for my granddaughter's 13th birthday later this month - Hope chest. I have an engraved brass plate with her name, birthday date for this year and "Hope in the Lord". Thanks so much. I do woodworking, but have been so busy I couldn't fit it in and thanks to you, you saved the day. I hope to do more business with you in the future. Let the folks who worked on it know that they did a great job." "My clock just finished chiming, marking the hour. Each time it does this I just love it. The soft, lovely tone adds to my overall enjoyment of the piece. The dark walnut matches as well as contrast with other furniture I have." "Our red cedar chest arrived last Thursday, as scheduled by UPS, in perfect condition. We are happy to have finally received it. It is beautiful in its simplicity, workmanship and utility. Our family will treasure it. Caroline A. Korn"
"We just received our Extra Large Classic Cedar Chest. Web photos don't do justice to the amazing craftsmanship of this heirloom. The color and wood grain variations are awesome--and it's smoothe as silk, inside and out. When it arrived I unpacked it (very well protected) and set it up to surprise my wife--as she entered the room, all I could hear was "Oh my God" about five times. She is indicating a reluctance to put anything in it--it really stands out in our 500 sq. ft. bedroom--it's the accent piece among white ash flooring and bleached oak furniture. I was a bit worried that it might clash with the overall lightness of the room--wow was I wrong. We also ordered the large plaque which reads, "GIBSON 2003"--to be passed down to my daughter and grandson and generations to come. Thanks for bringing quality products to the web." "We absolutely love our new cedar chest. We had very good experience with especially with our change of order. Thank you." 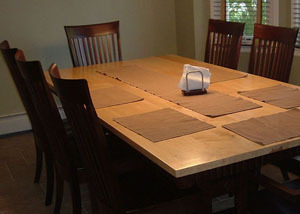 "They came in good time for my Saturday dinner, so I was able to use my lovely table to its full size. Thank you! All of my dealings with your company have been pleasant and your furniture is heirloom quality." "I just want to say THANKS. Our table is perfect - better than advertised! 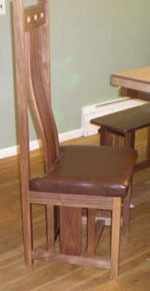 The quality of the wood is excellent, the craftsmanship is fantastic - the whole experience has been a pleasure.... In fact its soooo perfect we are almost too scared to eat on it for fear of a scratch! Thanks again, The Pallenberg Family"
"I just wanted to say how happy we were with the cedar chest we ordered! My daughter was so please and it was just beautiful! My other daughters were very excited as well, so we may have more orders in the near future. Thanks for everything!" "I have to admit we were a little worried about ordering the chest from your website. However, we decided to go for it and my wife loves the chest. It arrived well before Christmas, as promised"
"I just want to tell you how pleased I am with the cedar chest I ordered. The chest arrived in time for Christmas and I gave it to my daughter. She was completely pleased as was I. The chest was just as described and the delivery was timely and easy. This was a great shopping experience. I hope to do more business with you in the future. Thank you for your wonderful craftsmanship. Donna Phillips Donna Phillips "
"I received my order yesterday. The chest is wonderful, the workmanship is excellent and the smell as we unwrapped it was great too! Very many thanks." "Good morning, We received the chest yesterday which was a surprise birthday gift for my wife. You have more than exceeded my expectations with your product!! It is absolutely beautiful and what's more, the craftsmanship is exquisite! She is thrilled with it, which b brought tears to her eyes! Thank you again for providing more than what was expected! Roger Elliott "
"The table came Monday and Marty and I wanted to let you know how pleased we are. It is just BEAUTIFUL!! Please pass our thanks along to the craftsman who made it with such care. And thank you for your fine service. " "It was everthing I expected, I love the size!" "My table is everything I dreamed it would be!" "Beautiful piece - I'm immensely pleased!" "Very please with appearance and delivery service." "Pieces returned or correction came back perfectly and in less than 3 weeks turnaround. Thanks again for building such a beautiful product and matching it with fantastic customer service." "Quality Quality Quality !!!! I just recieved my hard maple hope chest today. It's absolutely beautiful. Your craftmanship, quality and service are outstanding! It's very hard to find that these days. I will definately refer you to all of my family and friends. I've also ordered a dozen folding gift baskets, I love them too." "Hello, We ordered a cedar chest from your company on 12/9/2006 for our recently married children. The chest arrived, as promised, before Christmas. I just wanted to tell you how pleased we are with the workmanship on the chest. It is beautiful, and our children are thrilled. 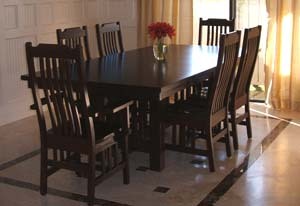 I would definitely recommend your company to friends and family for user-friendly ordering and quality furniture. Thank you very much. Rita Guttilla"
"I am so pleased with the beautiful furniture!" 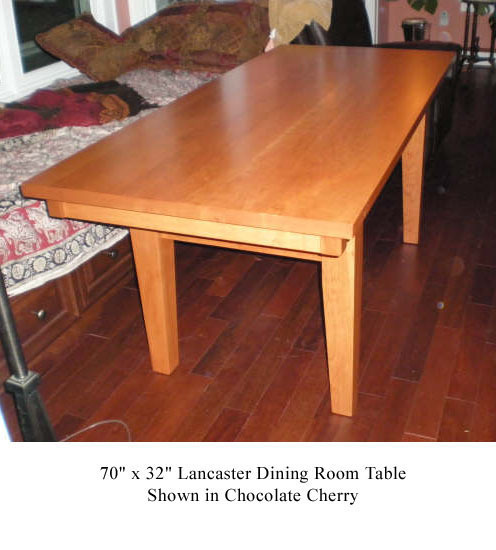 "My husband gave me an Extra Large Classic Red Cherry cedar-lined chest for Christmas. It is beautifully crafted, and came before we expected it. Thanks!" "A small music box, even better! Looks and sounds great." "Thank you for the wonderful craftsmanship on my new black walnut cedar chest. It is beautiful!!! It arrived in perfect condition. 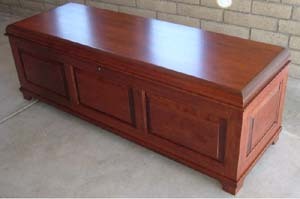 Thanks again, Anna Chavez "
"I was very happy with the beauty and the quality of the cherry cedar chest That I received. It was exactly as described on the web site." "WOW!!!!!!!!!!!!!!!!!!!! Excellent craftsmanship, just what I wanted, it looks perfect on top of our entertainment center. Can't wait to see the reaction on Christmas morning from the rest of the family. Very impressive and half the price of local stores. Thanks so very much"
"I was delighted with the entire process. Website was easy to use. It came very quickly, and the pacakging protected the chest (one side was crushed, but no damage). I am delighted!" "Hi, I just received my cedar chest and it is ABSOLUTELY GORGEOUS! I can't believe it but it's even more beautiful than I imagined it would be based on the online picture. Thank you so much! Sarah"
"Yesterday, (the craftsman's assistant) came to alter the table so that the leaves fit into it. Thank you so much for making sure that happened. All of our friends are in awe that we found you via the internet, and had both honorable service and such a high quality product. 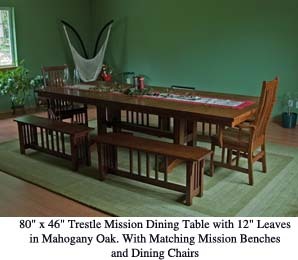 I'd been looking for a dining room table that stored its leaves for so, so many years. Thank you for the beautiful table- still looking beautiful after 2 years- and the attention to service along the way. Naomi Benditt"
"The chest arrived a few hours ago = we are THRILLED! I am astounded by how quickly this all happened. Having dithered and dabbled... Plan to pick our next "must have"as soon as we get back from our family weekend. Lisa"
"The chest arrived yesterday. The cherry wood and craftsmanship are stunning, coupled with a brilliant packing job, I could not be more pleased. Thank you so much." 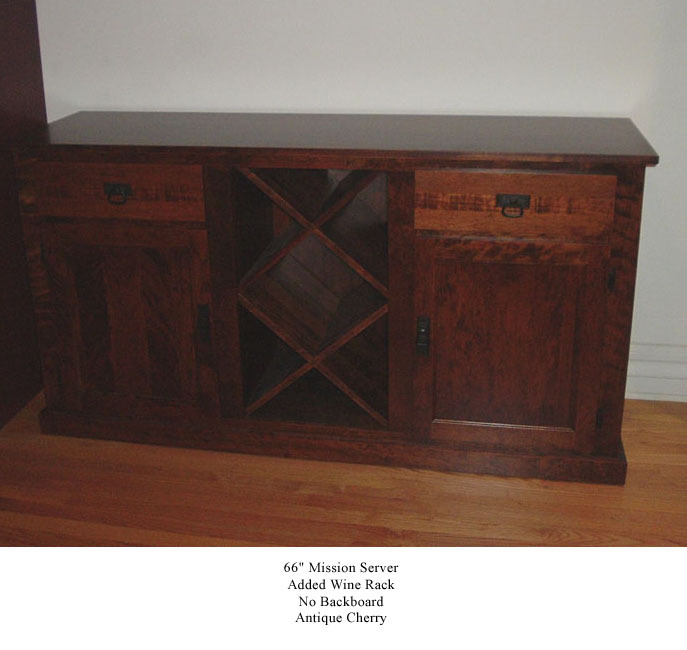 "We purchased a chest in Honey Oak with it 4-Sided to use as a coffee table. We were surprised when it came before 14 days, in great shape, perfect fit for the couch, perfect color, absolutely wonderful piece of workmanship. We couldn't be more pleased. We did this over the internet without seeing it first-hand, and we are completely satisfied." "I love my new Cedar Chest. It is just beautiful. I am thoroughly satisfied and thrilled with the workmanship. I plan to get my daughter a Chest for her 21st birthday." "We received the cedar chest on Monday and I wanted to tell you how beautiful it is. This was a Christmas present for my son...He was totally speechless. We are both so impressed with the quality of the workmanship. This is something he'll always treasure. And he's started giving hints about more furniture he'd like to have!!! Thanks so much for the excellent service, the beautiful chest...and for packing so carefully. It's nice to find a company who's truly customer-oriented. We couldn't be more pleased. God bless you all...and Merry Christmas... Trish Johnson"
"Received the chest. We are very pleased with the quality of the chest. Thanks for the prompt delivery." "It is what I expected. 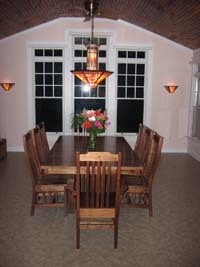 Very pleased with the color & quality of workmanship." "OoOooooooooooo!! That Easter Bunny was SOOOO cool! Our family has already declared it an *instant* antique. We've already used it as a trivet, too! We love the craftwork and the creativity of it." "I have been meaning to get back to you for almost three weeks now...I apologize for being so slow! I wanted to let you know that I am SO impressed with the cedar chest! It is just beautiful. Truly, it is a treasure and it's great to see that craftsmanship is alive and well. Too often these days the things we can buy are sorely lacking in quality. Well, that certainly isn't an issue! You, your company and the gifted individuals who share their skills with the world at large are to be highly commended. I tell anyone and everyone how happy I am with the chest! I can't tell you enough how happy I am with this beautiful piece of furniture!" 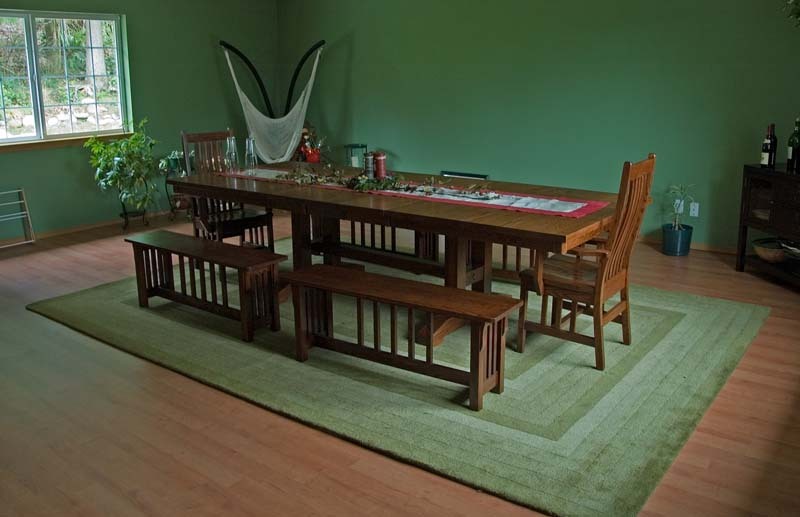 “We are thrilled with our new dining room set. 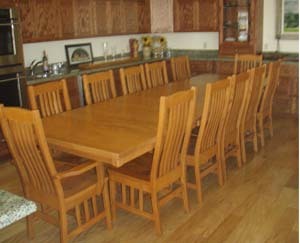 We were able to custom create a table the size we wanted and at counter height, along with ten beautiful chairs. The entire staff, from the first discussion about creating a table the size we needed all the way through to the delivery, was a pleasure to work with. The table and chairs is beyond our expectations. The craftsmanship is out of this world! We couldn’t wait to use the table – we ate lunch at it only an hour after delivery! Thank you so much for making this a wonderful experience and a piece of furniture that I will be able to pass along for generations to come!"